This Rover is one of our cars, which means that it has to be done between customers cars. A Rover 400 Gti this car will be one of the most orange cars around. 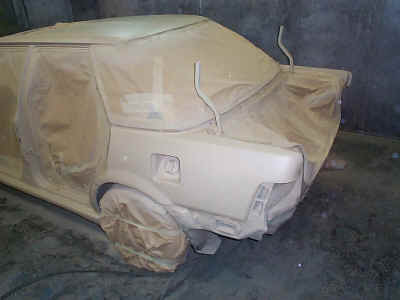 The car is to have our Gti style front and rear bumper, and side skirts, as the basis of the styling. The optional front splitter, skirt splitters, and rear bumper splitter/diffuser should set it above the rest, as should the EVO boot spoiler, rear screen spoilers and bonnet vent. 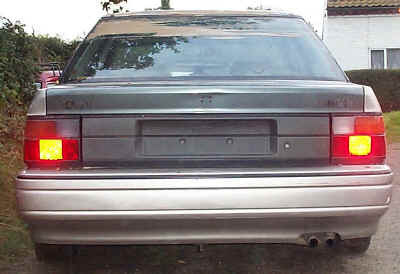 The twin headlights and twin taillights are really the icing on the cake. The car is to be bright bright candy orange with orange leather interior. Not a car you will be able to miss. 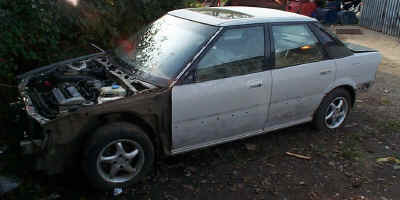 This Rover 400 Gti is the basis of the Project. It came to us after someone had used and abused the car, and then unable to handle the power (17 year old - just passed test) put it into a grass bank. 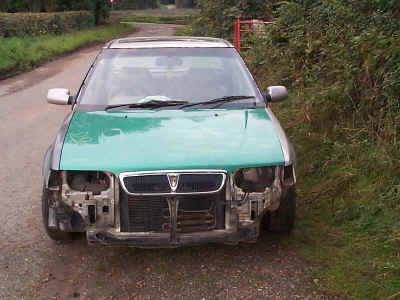 The front bumper, headlights and bonnet did not make it but the rest did. A half hearted attempt to repair it was soon forgotten when daddy bought him a new car, and here you see the basis of a project. Bought with the new panels fitted. The car is lowered but the balloon tyres and those awful wheels must go. 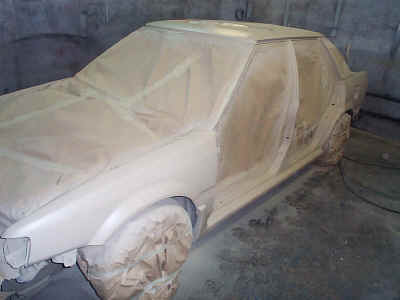 The shell is cleaned, and prepared for painting. 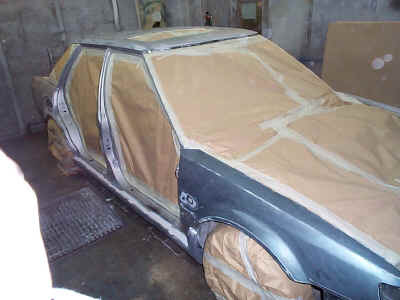 The doors are removed, and all dents and imperfections dealt with prior to masking, degresing, and priming. 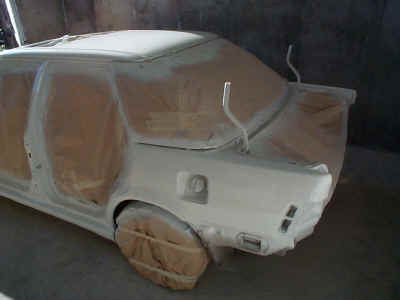 We use a high build primer which is beige, followed by sanding and then painting is white which is the ground coat for the orange. 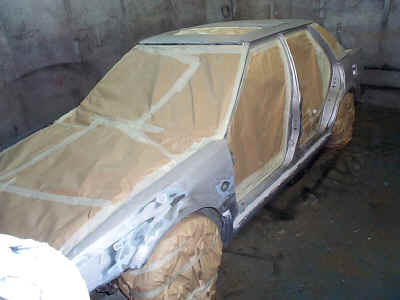 Next the doors, bonnet, bootlid, and all products to be fitted to the car, follow the same procedure until everything is in white ready for the final stages.